Italian jewelry designer Roberto Coin has embraced music as a muse to create the Symphony collection, with bracelets, earrings, rings, and necklaces meant to combine in perfect harmony. What is music to your aesthetic ears? Is it architectural, sleek line or hand-etched craftsmanship? You will find all of them in the beautiful and simple jewelry of Symphony by Roberto Coin. The collection has taken some cues from previous classic collections. 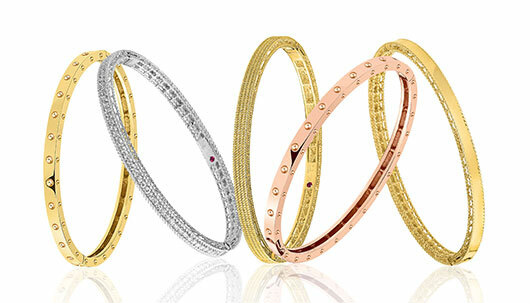 Pieces are available with and without diamonds, in assorted tones of 18kt gold. You’re invited to stack bangles and layer necklaces to create your own orchestral maneuvers, suited to your individual mood and style. Discover your Symphony today.